I travelled across Burma in the late 90's. Besides an introduction to the natural history of the country, I received an education about the 1988 crackdown, Burmese history since 1962 and about the daily fear of government from the people there. Even university professors there did not dare accept the scientific literature about biodiversity (even guidebooks) I had brought along. I brought the lot back to Singapore to mail to them later. Unlike 1988, people in Myanmar are able to send out information to the world. News: Google News - Yahoo! News - blog posts (all sorted by date). Topical pages: BBC - CNN. Ongoing: Wikipedia's 2007 Burmese anti-government protests. "Myanmar's [=Burma] military government has sealed off the country to foreign journalists but information about the protests has been increasingly flowing out through wire service reports, exile groups in Thailand with contacts inside Myanmar, and through the photographs, videos and audio files, carried rapidly by technologies, including the Internet, that the government has failed to squelch. The state-controlled press has carried no reports about the monks’ demonstrations. Since the military crushed a peaceful nationwide uprising in 1988, killing an estimated 3,000 civilians, the country, formerly known as Burma, has sunk further into poverty and repression and become a symbol for the outside world of the harsh military subjugation of a people. Mrs. Aung San Suu Kyi, who won the Nobel Peace Prize in 1991, has been locked inside her home for 12 of the last 18 years, and the government has arrested thousands of political prisoners." 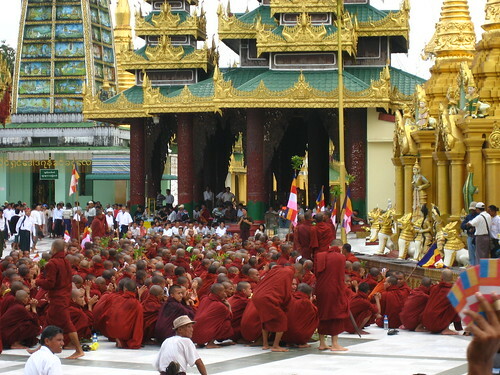 - "Monks' Protest Is Challenging Burmese Junta," by Seth Mydans. New York Times, 24 Sep 2007. [George Yeo] believes that the proposed visit of United Nations envoy Ibrahim Gambari to Yangon would be an ideal opportunity for Myanmar's military rulers to end the bloody crackdown on pro-democracy protests and launch a dialogue with the opposition. 'What is important now is to avert violence,' he told The Straits Times in an interview on Wednesday (US time) on the sidelines of the UN General Assembly meeting here. - "Myanmar crisis calls for fresh approach to nat'l reconciliation: George Yeo," by Derwin Pereira, US Bureau Chief. The Straits Times, 27 Sep 2007. "Soldiers fire weapons, tear gas into crowds of protesters," The Straits Times (Latest News). "Singapore-led ASEAN must take immediate, concrete action in Myanmar to prevent bloodshed," by Gerald Giam. Singapore Patriot, 27 Sep 2007. Posted at 12:14PM UTC by N. Sivasothi | permalink | , .